Grab great offers on your blood pressure medications at the most slashed down prices. You can order Diovan at huge discounts through our online pharmacy. 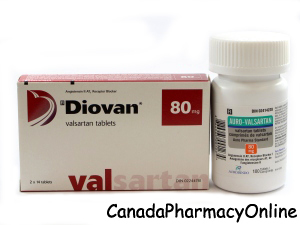 Canada Pharmacy Online is currently offering the brand name Diovan from Turkey and Australia manufactured by Novartis. The generic Valsartan comes from Canada and is manufactured by Sandoz. We sometimes stock the generic Valsartan from India also called (Valzaar H by Torrent Pharma or Valsava by Sava Medica). You can purchase Diovan through our Canadian dispensing pharmacy in the strength of 40mg, 80mg, 160mg and 320mg tablets and capsules. Customer's who order Diovan may also purchase Benicar and Cozaar. Diovan (Valsartan) is used to treat high blood pressure, heart failure and to lower the risk of death after a heart attack. Valsartan is an angiotensin II receptor antagonist. This medication works by keeping blood vessels from narrowing, which lowers blood pressure and improves blood flow. Diovan may be used alone or in combination with a diuretic. The full effects of the medication are usually seen within 4 weeks. You should not use Diovan if you are allergic to Valsartan. Before you start taking this medication, inform your doctor about your medical conditions and about all the medications you are currently taking including OTC and herbal medications. Diovan is in pregnancy category D (there is positive evidence of human fetal risk). It can cause harm to an unborn baby. Do not use Diovan if you are pregnant. Stop using and tell your doctor right away if you become pregnant. Valsartan can cause injury or death to the unborn baby if you take the medicine during your second and third trimester. Use effective birth control. It is unknown whether Valsartan passes into breast milk or if it could harm a nursing baby. You should not breast-feed while using this medicine. Diovan should not be given to a child younger than 6 years old. 1. What is the difference between Diovan and Diovan HCT ? Answer: Diovan contains the active ingredient Valsartan but Diovan HCT contains Valsartan and Hydrochlorothiazide. Hydrochlorothiazide helps prevent the body from absorbing too much salt which can cause fluid retention. 2. What is the best time to take Diovan? Answer: You can take Diovan at the same day every day as you wish. It is not important to take with or without food. If you miss a dose, you may take the missed pill immediately. Call your doctor for emergency help if you take too much Divan medication.